If current trends continue, 20% of our children will grow up poor, and most of them will never make it to the middle class. The average family will earn less and spend a greater share of its income on housing and transportation. By 2050, more than two million people will live in places vulnerable to repeated destruction and inundation from storms and flooding. New York’s ascendance in the global economy could be a distant memory, as more nimble and organized metropolitan areas surpass us by investing in technology, transportation and the health and education of their residents. To change course, our fragmented government institutions will need to greatly increase both the level and effectiveness of investments in infrastructure and housing. Both the poor and middle class will need access to more well-paying jobs and better schools. Our homes and workplaces will need to be far more energy-efficient, and much more resilient to the impacts of climate change. Rather than resist growth and change, we can capitalize on an expanding economy to reduce poverty, improve health, make the region more affordable, protect and enhance our natural environment and insure that benefits of growth are broadly shared. 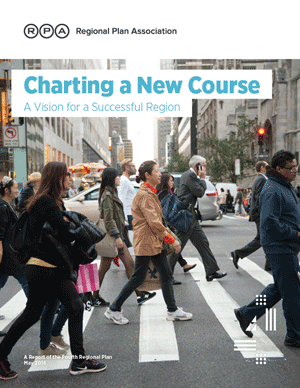 To visualize what we are capable of achieving, as well as the dangers of staying on our current course, RPA has developed an aspirational vision for the metropolitan region. This framework draws on three years of research, analysis and engagement with policy experts, civic groups and community members throughout the tri-state area. We invite comments on the goals and concepts that are represented here. The benchmarks below are intended to describe some ambitious but attainable outcomes. These don’t include every measure of success, nor do they include prescriptive policy proposals for how to achieve them. In 2017, RPA will release its fourth regional plan with specific proposals and strategies to address our vast challenges and fulfill the vision of a prosperous, fair and resilient region. The hard-won economic expansion that the region has experienced since the mid-1990s is at risk. Aging infrastructure, high costs and intense international competition from cities ranging from London to Shanghai could undermine the growth that generates job opportunities, wealth creation and tax revenue. Without more well-paying jobs, average incomes will continue to stagnate. And unless we can reduce the region’s high degree of economic and racial segregation, far too many residents will remain cut off from good schools, housing and job opportunities. Expanding prosperity and opportunity will require scaled up job creation, housing, physical infrastructure and human development strategies. Achieving the following measures of success, based on analysis of both current trends and the region’s potential, would grow the economy, create more employment and career opportunities where they are needed most, and help reduce economic and racial segregation. 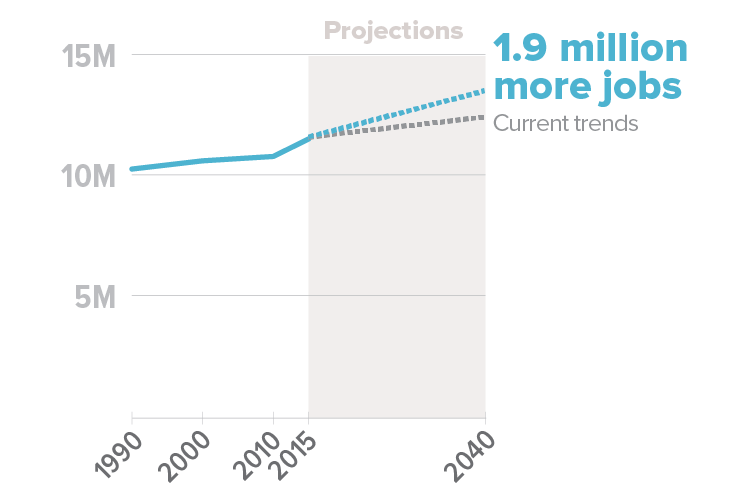 With sufficient housing and infrastructure capacity, the region could gain an estimated 1.9 million more jobs by 2040, more than twice what is likely under existing trends, adding $760 billion to the region’s economy and offering more chances for employment and higher incomes in industries ranging from health care to high-value manufacturing. Cities like New Haven, Newark, and Newburgh can reverse decades of job loss and add 360,000 jobs, six times as many as if current trends continue, expanding employment opportunities for residents and bringing in tax revenue to improve schools, safety and services. Through well-designed downtown redevelopment and infill, high-income communities can expand the number of multifamily units at more than twice the rate expected under current trends. Including low, moderate and middle-income units and strengthening fair housing laws and enforcement will increase the chances for everyone to go to a good school and have access to quality housing, jobs and services. 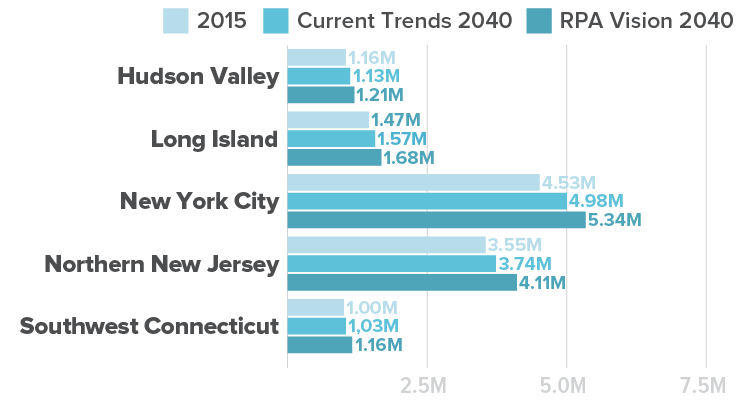 The New York region is one of the most expensive places to live and do business in the U.S. Rents, mortgage payments and property taxes take a much higher share of household income than they did two decades ago, and for many families and individuals leave little for other needs. Transportation is often the second biggest expense, and the long commutes that characterize the region exact a cost in both time and money. Improving affordability will require policies that not only reverse the rapid escalation of housing costs overall, but also expand low- and moderate-income housing where the need is most intense and locate new housing and jobs in ways that reduce commuting costs. Achieving the following would reverse the upward trend in housing and transportation costs and expand affordable housing choices for lower-income residents. The typical household spent 51% of its income on housing, real estate taxes, utilities and transportation between 2009 and 2013. Bringing that down to a more manageable 45% will require multiple actions—increasing incomes, building enough new housing to meet demand, making government more efficient and reducing driving times and distances. Transit investments and transit-oriented development can attract most new jobs and housing to places that are within a half-mile of a subway or commuter rail station, reducing automobile use and the time and cost of travel, increasing number of jobs within a reasonable commute of workers and expanding the labor force available to employers. Residents of the region are living longer than ever before, and safety and the quality of public spaces have seen great improvements. But the region still has a long way to go in order for everyone to live in safe, healthy and attractive environments. The quality of our physical and mental health lags behind the country’s best-performing regions, and nearly every measure of health shows wide disparities by race and income. Less than half of the region’s residents live in complete neighborhoods, within walking distance of amenities such as grocery stores, schools, parks, shopping or transit. More than five million people, especially those who are poor, black or Hispanic, live close to waste facilities, power stations or other uses that threaten their everyday health and safety. Creating a healthier and more livable region will require providing all communities with clean air and water, encouraging physical activity, maintaining safe streets, reducing the time and stress of commuting, and ensuring that everyone has both physical and virtual access to everything from health care to education. Achieving the following benchmarks would mean that people would spend more time walking and less time in traffic, and have greater access to the things that are needed to improve their quality of life. We can build half our new housing in communities where people already enjoy better health and well-being by walking on safe, attractive streets with access to fresh food, parks, libraries and other needs, and transform other neighborhoods to improve walkability. 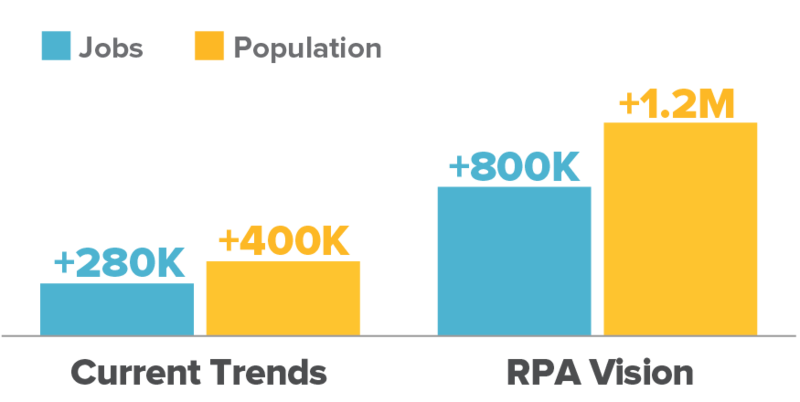 Source: Walk Score® 2014; Note: The Walk Score® rankings were generated from the centroid of each block group, and then aggregated to RPA’s grid. It doesn't represent the ranking of the block group as a whole. Transportation choices can be increased and traffic congestion can be reduced with extensive transportation improvements, including modernization of existing bus, subway and rail service, new transit services, managing highway and road traffic, and by locating housing and jobs closer to transit. High-speed internet is increasingly vital to accessing educational or employment opportunities as well as getting essential services. But 22% of the region’s households lack broadband at home, and this is particularly true among low-income households. Adapting to climate change may be the greatest challenge we face. Scientists have estimated that sea levels will rise from one to three feet by mid-century, more frequent and intense storms will affect large swaths of both inland and coastal areas, and more intense heat and cold will put the health of the most vulnerable at risk. Yet greenhouse gas emissions remain much too high, and the natural systems that help protect against the impacts of climate change are at risk. Creating a more resilient region requires doing all that we can to slow the rate of global warming and adapting to both the immediate and long-term impacts that are now inevitable. Achieving the following would sharply reduce the region’s emissions of harmful greenhouse gases, protect the natural environment that helps cool the region and absorb flood waters, and protect those most at risk. 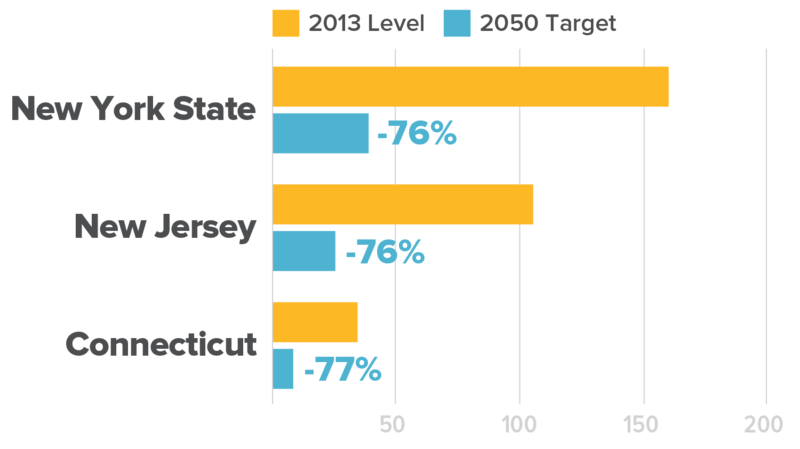 Achieving this ambitious goal adopted by New York City and by New Jersey, New York and Connecticut will require establishing more compact settlement patterns, generating cleaner power, reducing emissions from cars and trucks, and making our buildings more energy-efficient. Sources: World Resources Institute; U.S. Energy Information Administration. Note: 1990-2011 data from WRI; 2012-2013 data from EIA. With more sustainable development, the region could accommodate twice the level of population growth on half the amount of land than under the current trajectory. Comprehensive strategies, from restricting growth in the most threatened areas to expanding both natural and engineered flood protection, can greatly reduce physical, social and economic vulnerability of residents living in the rapidly expanding flood plain. To become the prosperous, fair and resilient region we envision, the region will need to adapt to an uncertain global economy, rapid technological change, rising seas and more frequent and intense storms, and a new generation that will make different choices for living, working and leisure. These changes will come with a growing economy and population, and how we plan for that growth will in large measure determine our success. 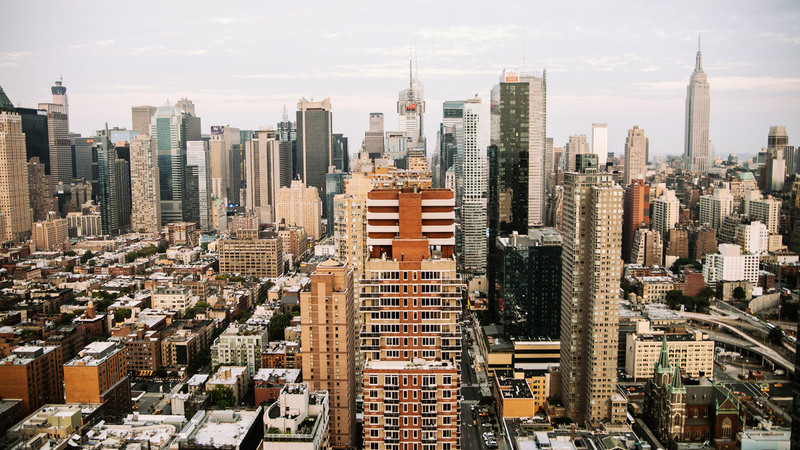 Nearly 23 million people live in the New York metropolitan region today, and that number is expected to continue rising over the next 25 years. Much of the growth will come from new births and from greater life expectancies of the large baby boom generation. The region also can continue to expect young adults, immigrants and others seeking economic opportunity to continue to migrate to the region. Bolstered by advantages in the global economy and the area’s diversity of leading industries, the New York region has the potential to attract and harness the substantial job and population growth it needs to reduce unemployment and poverty, generate real prosperity for the majority of households that have not seen their incomes rise, and generate revenues to improve services, modernize infrastructure, expand the number of affordable homes, protect open space and hold down tax rates. With the right investments and policies, the region could sustainably add around 1.9 million jobs on top of the 11.6 million here now, and 3.7 million people to the existing population of 22.9 million. On the other hand, if we continue on our current path, growth is likely to be half this amount while continuing existing patterns of inequality, declining infrastructure quality and vulnerability to climate change. Residents over the age of 65 are expected to account for more than two-thirds of population growth as the large baby boom generation enters retirement age and life expectancy increases. This will create the need for more housing for smaller households, expanded medical services and communities that are designed for a wide range of preferences and physical needs. Hispanics, blacks and Asians will continue to grow in number as the region becomes majority non-white. Greater diversity will be an asset in the global economy, but the region’s segregated settlement patterns make it more difficult to meet the housing and economic needs of this growing population. Millennials, our largest generation since the baby boom, will reach full adulthood and middle age. How this generation, their children and newer immigrants prefer to live, work and form families will have a profound effect on housing choices and transportation needs in both cities and suburbs. Rapid transformation in personal communications, transportation technologies and data use and availability will continue. Jobs are likely to require higher skills and people will work more often from home. Digital service will become increasingly important to both regional competitiveness and reducing inequality. 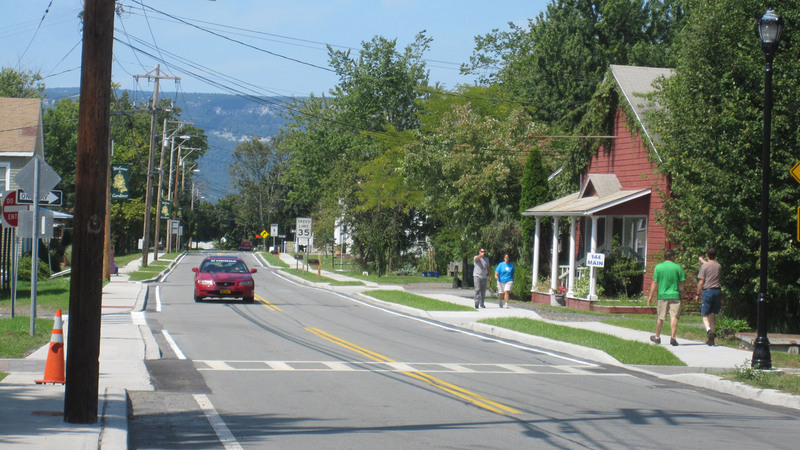 Much of the region’s physical infrastructure is more than a century old, with much of it past its useful life and ill-suited to current needs. Without upgrading and retrofitting these systems, it will be impossible to keep up with changing demand, much less accommodate future growth. Seven decades of urban sprawl has consumed much of our green space and half of the region’s wetlands. This leaves the remaining open space further from employment and services, vulnerable to further development as only a quarter of it is protected, and often in the most environmentally sensitive areas. Within the urban core, most vacant buildings and larger infill have been redeveloped, making new development more difficult and costly. To evaluate how the region could best develop sustainably and equitably, RPA mapped and analyzed different types of places, and tested alternative scenarios to see what outcomes would be produced under different assumptions. We live and work in places ranging from one of the densest commercial centers in the world to vast, sparsely populated landscapes. Growth patterns are equally complex, as the region has developed around multiple centers of activity. To understand the characteristics and dynamics of these diverse places, RPA divided the region into five types of places, which served as the underlying structure to analyze future development and growth patterns. Select a place type to learn more. The Urban Core contains the dense and centrally located places in the region, including most of Manhattan, Brooklyn, Queens, and the Bronx and large portions of Hudson and Essex Counties in New Jersey. These places are characterized by a compact and connected urban fabric, with either the highest density of employment or residential, or a combination of both. Downtowns and Local Centers are places that serve both as local employment and commercial hubs and have a great deal of housing either mixed in or surrounding. These can be large urban centers, such as Bridgeport and Paterson, small suburban downtowns, or mixed-use corridors that often serve as central places. Commercial and Industrial places are mainly employment-oriented, typically with a dominant single use, such as shopping malls, industrial parks, etc. They are usually found outside the region’s core, are well-separated from other uses, and tend to be heavily paved, feature sprawling buildings, and are accessible only by car. Primarily Residential makes up most of the region’s suburbs, with a lower density of development that is devoted almost entirely to single-family housing. 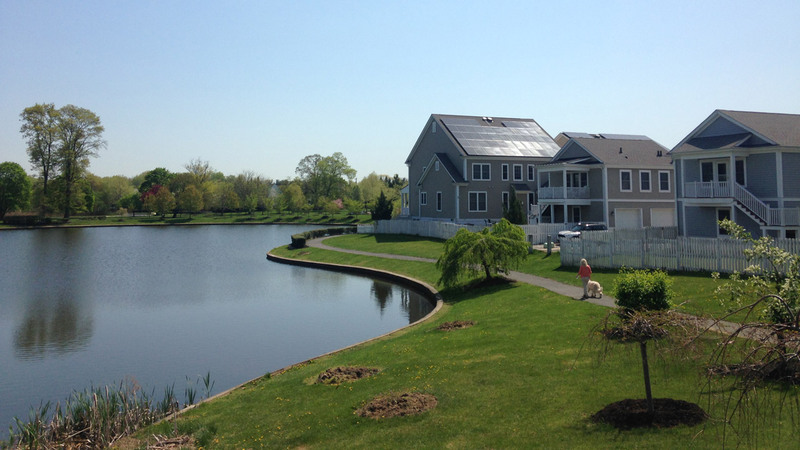 These places range from walkable neighborhoods with highly connected street networks to isolated cul-de-sac developments. Rural and Open Space make up the very lowest density places, frequently farm land or protected or unprotected open spaces. 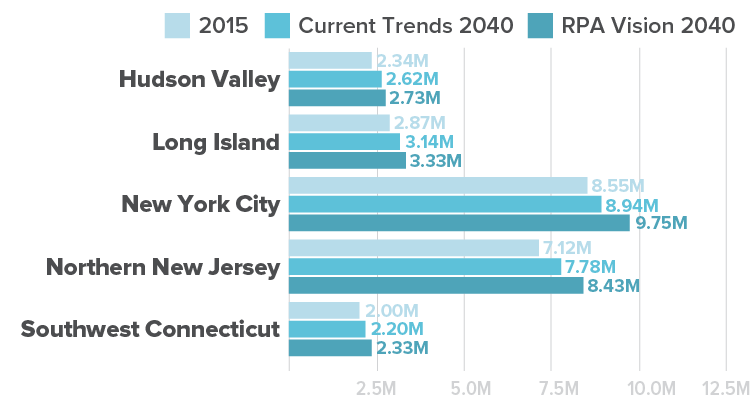 To test how the region would fare under alternative assumptions, RPA initially evaluated four scenarios for how the tri-state region could accommodate 1.9 million jobs and 3.7 million residents. Each of these emphasized a development pattern associated with a particular objective—protecting the natural environment, strengthening the urban core, reinvigorating downtowns outside of the core, and supporting more sustainable suburban growth. The region’s settlement patterns are organized around natural systems. Infrastructure and redevelopment create more room for growth in the region’s urban core. The largest number of people and jobs gravitate to the region’s large, medium and small centers outside of the core. Suburban centers and corridors are redesigned and retrofitted to make them more socially and environmentally sustainable. By exploring these scenarios, different choices and trade-offs were highlighted. For example, the hyper-concentration of employment called for in “Reinforce the Center,” or “Grow With Nature,” would contribute to further polarization in the region as well as call for the greatest amount of transit infrastructure into the region’s core. On the other hand, a more distributed jobs and housing approach such as that fostered in “Reinvent the Suburbs” further stresses our impact on climate change, given its continued auto-dependence and low-density development. “Resurgent Downtowns” showed an ambitious scenario where more people and jobs would go to places where infrastructure, services and community amenities already exist, but required extraordinary measures in terms of governance and transformation of current development and employment trends. 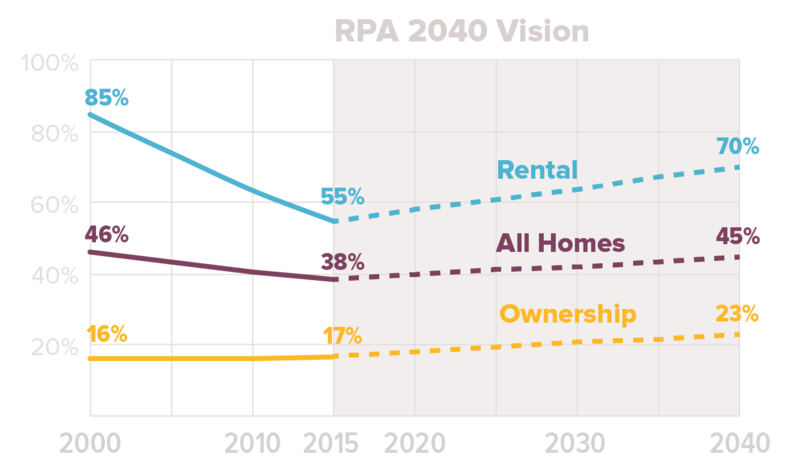 By assessing the trade-offs of these scenarios, and evaluating growth capacity in different parts of the region, RPA developed an aspirational vision for the region in 2040. The scenario isn’t a prediction of what is most likely to happen. Rather, it represents an outcome that would best support a vision that would equitably expand the region’s prosperity with more environmentally sustainable patterns of development. In this future, 44% of the region’s new jobs would be in the urban core, where the region’s robust transit network connects to the lion’s share of the metropolitan area’s workers. But downtowns and centers outside of the core would grow most rapidly, expanding by 26%, or 2.3 times the rate of the recent past. Jobs would return to small cities and suburbs that have stagnated in the last decade and a half, but in more transit-accessible locations. Population growth would be more evenly distributed, but with more in the region’s core and inner suburbs as sprawl dissipates. New York City’s population would grow to 9.7 million from its current 8.5 million, an increase of 14% compared with the 17% increase of the last 25 years. 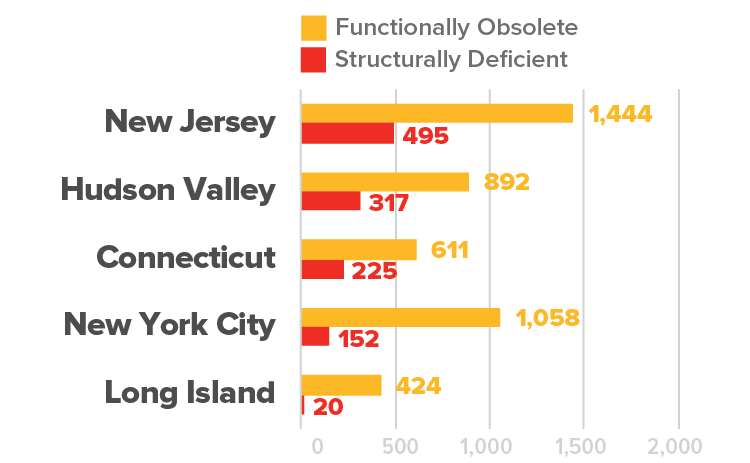 But the inner ring counties of Nassau, Fairfield, Westchester, Bergen, Hudson, Union and Essex would expand at a faster rate, growing by 20%, largely because cities and suburban downtowns in these areas would become thriving mixed-income communities. Respect and support existing communities by making new development consistent with the local context. New uses and densities will relate to the existing fabric, and be supported by robust engagement and good community design. Promote healthy connections between the natural and built environments. Communities will be connected with parks and coastal areas with bike lanes, greenways and trails. Make efficient use of existing land and infrastructure. The value of high value land will be maximized and stress on the transportation network will be reduced. Target development in existing and new transit-oriented centers to create vibrant and compact communities. Residents will have a better and faster commute to and from work, and more amenities in a walkable environment closer to home. Tap into the growth capacity of older downtowns. By fostering more development in places like Jamaica and Newark, with existing infrastructure and services, the region will better utilize its existing assets while bringing more opportunities and options to current residents. Foster new employment centers and mixed-use communities by redesigning corridors and “edge cities” with critical mass of people and jobs. Places such as Route 110 in Long Island’s Suffolk County will become new destinations for their surrounding communities, providing more amenities and transportation options to those working along those corridors as well as those living in close proximity to them. Allow for accessory dwelling units in moderate to mid-density residential areas. These policies will allow multi-generational communities throughout the region to accommodate our aging population, as well as provide income that many homeowners need to maintain their mortgage and tax payments. Promote mixed-income housing in high-income communities. Children and adults from lower-income and minority families will have access to better schools, housing and services often found in these communities. Increase the number of well-paying jobs accessible to poor communities. 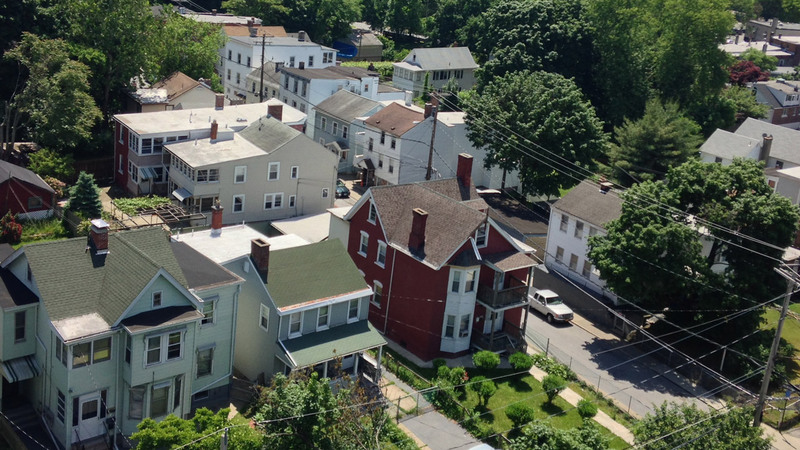 Someone living in a place like Newburgh or Paterson will have access to more jobs, and an increased tax base will provide more revenue for schools, police, parks and other services. Protect healthy industrial areas by limiting residential and office development. Viable and needed production and distribution businesses will be able to secure their leases and stay in current industrial areas without being displaced by higher market value developments. Limit growth in the floodplain. By planning around the impacts of climate change, there will be fewer people at risk in the future, less need to invest federal and local funds into rebuilding after a disaster, and a renewed opportunity to revitalize other sections of town. Protecting places such as the New Jersey Highlands will preserve these natural open spaces for future generations to enjoy while maintaining an adequate supply of clean water as well as mitigating flood events and extreme heat. Transforming the region will require a generation-long effort and new ways of addressing persistent and growing challenges. But we need to start now with clear-eyed understanding of what will be required. Providing the housing that we need to make the region more affordable and generate enough economic growth to raise incomes means that we will need to increase housing production by 50% while limiting gentrification, preserving and increasing the amount of low, moderate and middle-income housing, and improving quality of life. Creating better places to live means that we need to not only provide enough affordable housing, but also the schools, parks, sewer capacity and other infrastructure needed accommodate 3.7 million new residents in more livable neighborhoods. Keeping the region competitive with its global peers and making it an easier place to live and work means that we will need to provide the capacity for a 1.4 million increase in work trips while improving service and transforming the transportation system to support a region with rapidly changing travel patterns and needs. Protecting more than two million people vulnerable to flooding will require renewed respect for our natural environment. This will entail a different approach to managing our shorelines, learning to live with water as well as both expanding our concept of infrastructure to include our wetlands, waterways and forests and investing in new engineered systems. As it is increasingly likely that our region will see three feet of sea level rise within the next 50 years, resulting in the permanent flooding of land where 160,000 residents currently live, early actions must take place in these “sea level rise” communities. To be able to achieve all this, there is the need to overcome our fragmented governance systems and remake institutions that were created for a different time with different needs. Over the next year, RPA and its partners will develop a comprehensive strategy that addresses these and other challenges. The new regional plan will build on the legacies of the past while mobilizing the innovation and energy of a new generation. Regional Plan Association is America’s most distinguished independent urban research and advocacy organization. RPA improves the New York metropolitan region's economic health, environmental sustainability and quality of life through research, planning and advocacy. Since the 1920s, RPA has produced three landmark plans for the region and is working on a fourth plan that will tackle challenges related to sustained economic growth and opportunity, climate change, infrastructure and the fiscal health of our state and local governments. For more information, please visit www.rpa.org.